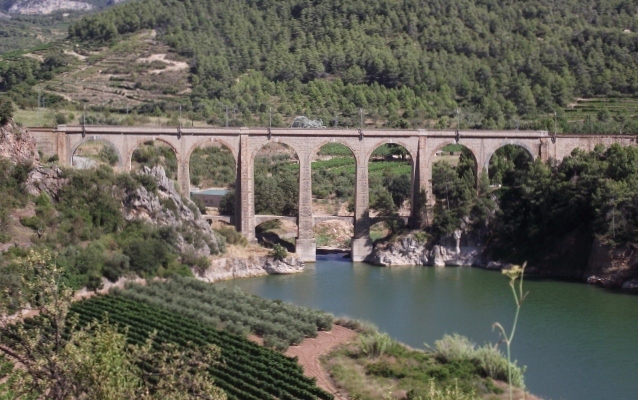 Nestled in a valley in the hills that is home to the Guiamets reservoir, is the village of Capcanes in the DO Monsant. 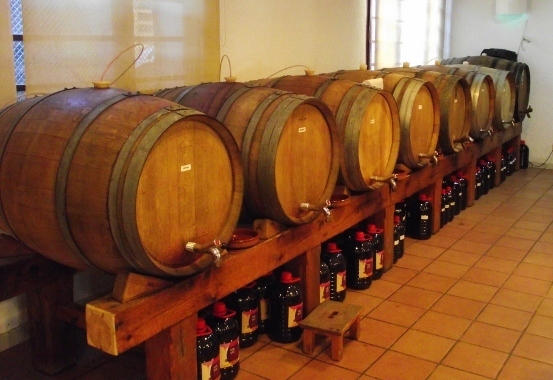 The Celler is most famous for its Kosher wine. 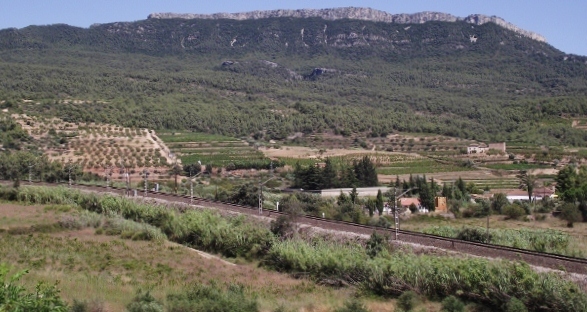 Although the wine it produces here for export and local consumption is equally well known albeit that in the UK it is sold under another name in M&S and Oddbins. If you look for the origin Monsant DO you will probably hit the mark. The Celler dates back to the 19th century but during the early 20th century the vineyards were devastated by the disease phylloxera. Later in 1933, 5 families got together to form a co-operativea. Here they made their wines and sold it under the name of Capcanes wine. 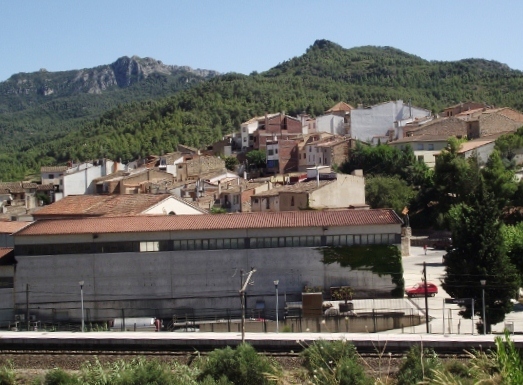 Modernisation took place in the Celler in the mid 1990’s, with the whole village taking a share in the co-operativa making a total of 80 members. Of these, 15 have a 75% share and make the decisions, which have turned this into an internationally known Celler. Although this was a large leap for many, their belief in their wine has paid off. This is the Celler at Capcanes. It may seem small in comparison to some of the Cellers, but inside it is a bit like the Tardis. Spacious, with underground storage for the oak casks in large cool cavernous rooms, lit by pale green lights. There these giants sleep, whilst turning their contents into some of the most delicious wines of the region. Here they are tended and cared for until the wines they hold have reached maturity and are bottled. As you enter the Celler you come into a wide room, where the various wines are on sale and display. Along one wall are bottles, with two large vats opposite from which you can buy red or white wine. Then there are the oak casks which contain vermouth, wine both red and white, Garancha Dolce, which can be bought in 2ltr bottles. 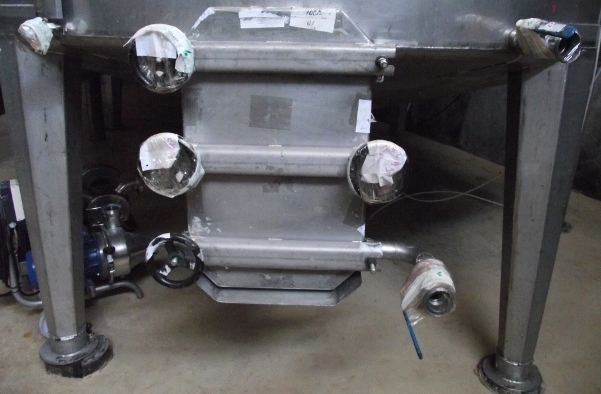 They have and use, the concrete vats both underground and free standing. Again there is the green lighting in this area, this is where the wines for the commercial and local market are produced. But it is the Kosher wine that they have become famous for, making it in the traditional way. Every seventh year after the first harvest, the fields must lay undisturbed, and nothing can be planted in between the rows of grapes. All the ingredients yeast etc., used in the production of the wine have to be Kosher. From the beginning of the harvest only Kosher tools can be used. The equipment, must be cleaned with hot water several times in some cases, to ensure that nothing remains in either the vats or on equipment. Once the harvest has begun only Jewish males are allowed to come into contact with the wine. It accounts for 2% of the total wine produced here. 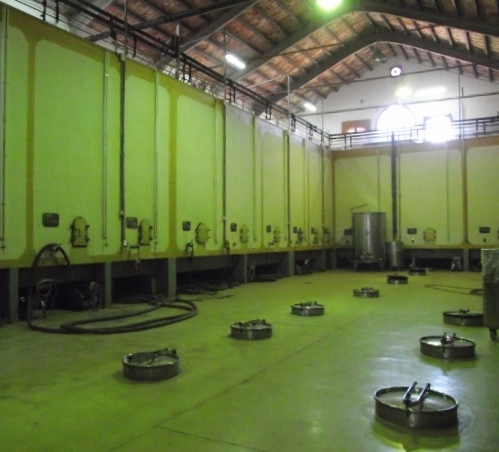 The vats and crushers used in the making of this wine, once cleaned are sealed until the next harvest. Likewise the vaults where the wine is stored in casks and bottled. 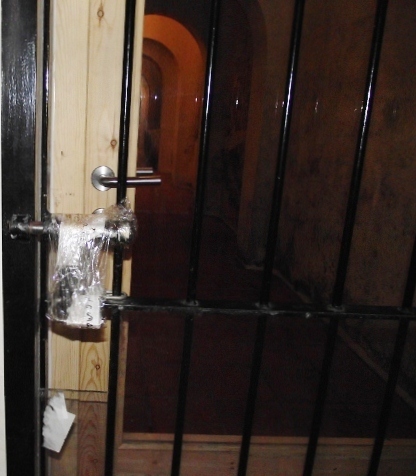 The Glass doors are locked and the metal grill gates are sealed. 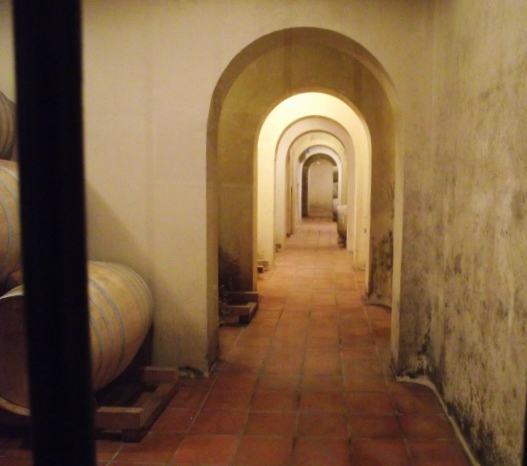 Behind them you can see the long corridors with the arched storage rooms for the casks and bottles. 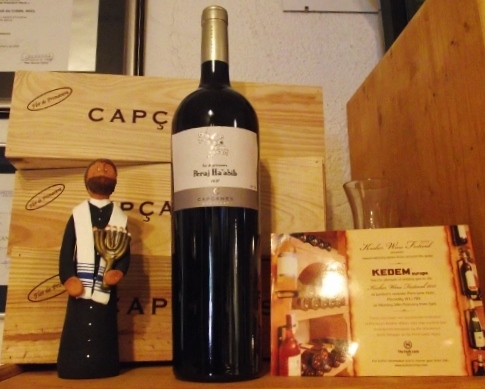 You can buy bottles of the Kosher wine just like the other wines. I would like to say that although expensive it is well worth the money. 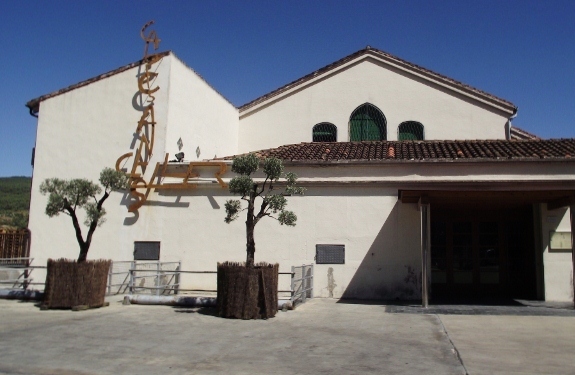 The grapes grown here are Garnacha, Carinena, Cabernet Sauvignon, Merlot, Tempranillo, and Syrah with the white wines being Garnacha Blanco and Macabeu. These produce around 1.1 million kg of grapes from roughly 250 hectares of vineyards. Has a lovely herby nose which is fresh and slightly lemony, with some oak. I am not too sure it is for me, but I would buy it. Reminds me of boiled sweets with a slight hint of blackberries. This is a very soft drink, just right for a sunny afternoon. A slight hint of liquorice and fruit with a shade of oak wood at the end. very pleasant. This is a typical Garnacha, sweet with a hint of something savoury and a ghost of spice that you just can not place. I like this wine. Carignan. It is aged in new oak, giving a liqueur-like quality, with again the liquorice bouquet. Nice drink with your meal. This wine is full bodied, with a rich spicy bouquet. A wine which is both delicious and intense. Well worth the money, and another one I like. This wine is made from the Garnacha grape off the old vines. It is a deep red full bodied wine, almost on the port side. This is a wine I find rather rich, but my wife is very fond of, drunk like a port it is superb. An alternative for the Christmas table. Both my wife and brother-in-law like this wine. It is bought from the Celler’s shop from the cask. Again it is like a smooth port, good body warm taste with a deep colour. My brother-in-law says that when he buys a wine that is a bit on the tart side, he decant’s it and adds some of the Garnacha. He says it improves the wine no end, he also guards the Garnacha, he’s most impressed. This is the river bar, only open in the evenings, It overlooks the river near the bridge which people have named the McDonald’s bridge because it looks like the symbol, only it has been here for over 80 odd years. 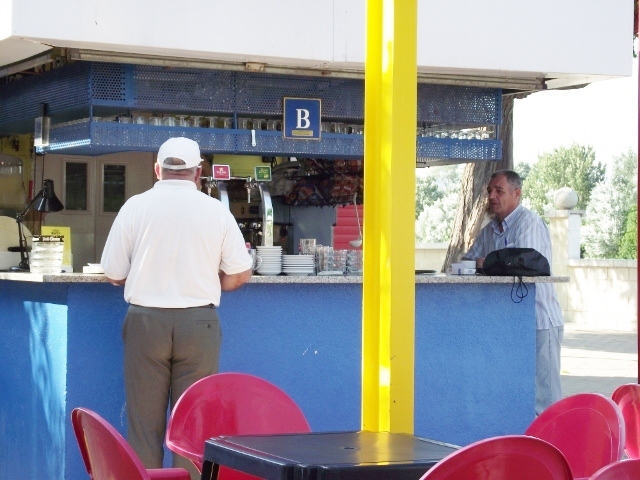 The river bar is bright and relaxing, we sometimes go there after I have finished playing petanca as it’s near the courts. Looking at these pics it does not seem possible that all is not calm, however it has been one of those weeks again. It all started when I woke on Saturday morning with a bad back. All the good work the chiropractor has done somehow got undone over night. I have been a good boy, not lifted anything, just played petanca and taken my wife shopping. I do enjoy our Wednesday trips to the market, then coffee after really nice. After that we went to the Club Nautique bar for a drink as it was a hot day. 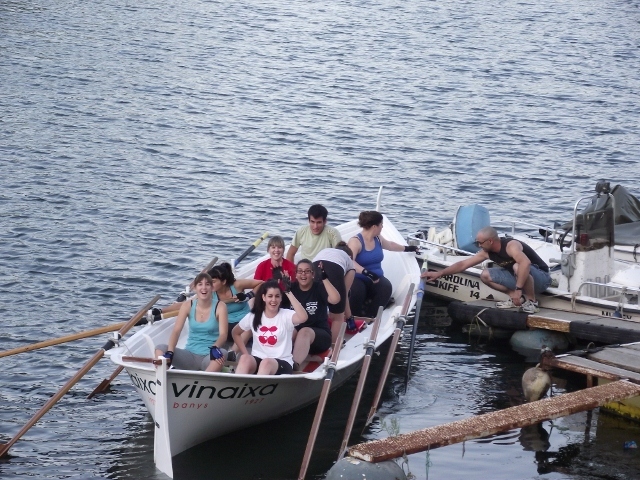 We sometimes stop here after petanca and watch the young rowers practice for the Muleta races. Normally they would have taken place a week ago but the new mayor of Mora D’Ebro cancelled the Mora Morisco, so no races or fiesta. Anyway here are the boys and girls practicing. 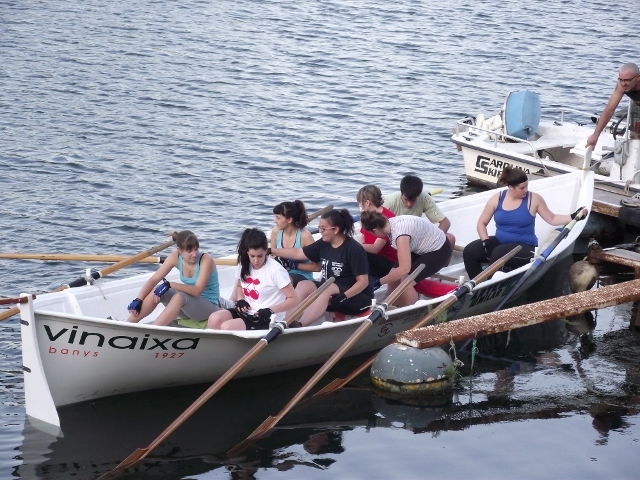 As you can see from these pictures the boats are large and can be heavy to move but the smiling faces of the girls says how much fun they actually have. So after a drink and game of draughts we went home. The rest of the week passed without any problems, but when I woke on Saturday my back was very painful, I really don’t know what I had done to it, but I watched the F1 qualifier not too bad, bit disappointed in Maclaren though. However, Sunday was another matter. I think I mentioned that my wife won a Hammon, (this is dried ham) so just before F1 started I decided to cut some slices to munch while it was on. Now the knives that are needed to cut these hams are razor sharp, the outside of the dried ham is rock hard, says it all really. So suddenly, there I was arm in air, wife doing her oh my god he’s hurt routine. When I had finally convinced her that it looked worse than it was, (the blood on the kitchen floor and over the sink didn’t help) out came the nurses hat and the iodine… Oh how I hate that stuff it really really stings… That was bad enough but it was the alcohol she used to clean the wound that made me shout, well living in the country side you have to take proper precautions when silly old fools do this sort of thing. So I have spent the week with a plaster on my finger, it came off today there will be a scar crescent shaped but hey battle scars are ok. Anyway she rang the chiropractor and made an appointment, on Monday it was back to see the chiropractor and now it’s no petanca, again. There is a competition coming up next weekend expect my wife will have to take my place in the team, they will win, hey ho…. But before that we went shopping into Carrefore, then to Lee Roy Merlin’s (that’s a bit like B&Q) so what did I buy? A nice chainsaw to help me cut the olive wood, strange really, my wife won’t let me use it, something about silly old fools and tools…..